Angelina Ramos Gutierrez passed away peacefully at her home in Arrey, NM on Monday, December 10, 2018, at the age of 83. 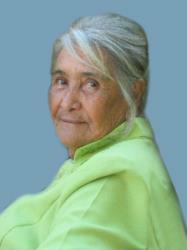 She was born on July 20, 1935 in Namiquipa, Chihuahua, Mexico to Julian Ramos Delgado and Guadalupe Ramos Rivera. Angelina will be lovingly remembered by her husband, Daniel Gutierrez-Hernandez; her children: Israel, Joel, Genoveva, Esperanza, Abigail, Daniel, Rene, and Becky; 23/grandchildren; 35/great grandchildren and numerous other friends and family members. She was preceded in death by her parents, Julian Ramos Delgado and Guadalupe Ramos Rivera. Visitation for family and friends will be held at the Kirikos Family Funeral Home Chapel on Friday, December 14, 2018 at 9:00 A.M. A Funeral Service will follow at 10:00 A.M. with Emilia Barraza officiating. Mrs. Gutierrez will be laid to rest at the Arrey Cemetery following the service. Casket bearers will be Israel Gutierrez, Joel Gutierrez, Danny Gutierrez, Rene Gutierrez, Israel Gutierrez Jr., and Nicholas Gutierrez. Honorary casket bearers will be Luis Grijalva and Daniel A. Gutierrez.